Does your API suffer from code bloat or wasted developer time due to implementation of simple input validation rules? One of the necessary but least exciting aspects of building a robust REST API involves implementing basic validation of input data to your API. In addition to increasing the size of the code base, validation logic may require taking on extra dependencies and requires diligence in ensuring the API implementation doesn’t get out of sync with API request/response models and SDKs. Amazon API Gateway recently announced the release of request validators, a simple but powerful new feature that should help to liberate API developers from the undifferentiated effort of implementing basic request validation in their API backends. This feature leverages API Gateway models to enable the validation of request payloads against the specified schema, including validation rules as defined in the JSON-Schema Validation specification. 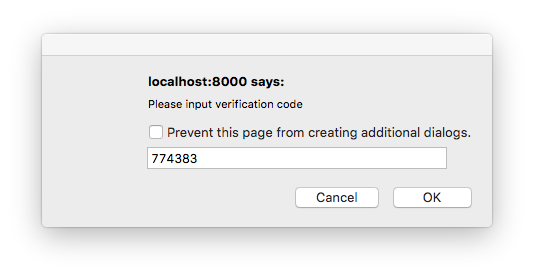 Request validators also support basic validation of required HTTP request parameters in the URI, query string, and headers. 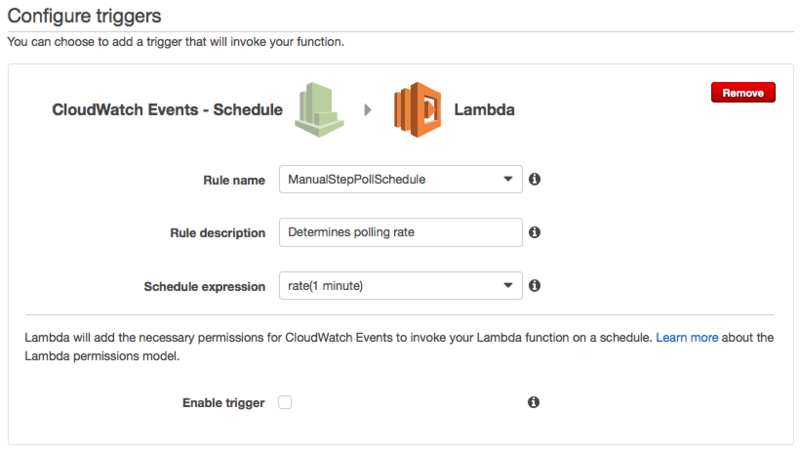 When a validation failure occurs, API Gateway fails the API request with an HTTP 400 error, skips the request to the backend integration, and publishes detailed error results in Amazon CloudWatch Logs. Jumia is an ecosystem of nine different companies operating in 22 different countries in Africa. Jumia employs 3000 people and serves 15 million users/month. Want to secure and centralize millions of user accounts across Africa? Shut down your servers! Jumia Group unified and centralized customer authentication on nine digital services platforms, operating in 22 (and counting) countries in Africa, totaling over 120 customer and merchant facing applications. All were unified into a custom Jumia Central Authentication System (JCAS), built in a timely fashion and designed using a serverless architecture. The full code for both scenarios—including SAM templates—can be found at the samljs-serverless-sample GitHub repository. We highly recommend you use the SAM templates in the GitHub repository to create the resources, opitonally you can manually create them. The full code for this blog, including SAM templates—can be found at the samljs-serverless-sample GitHub repository. We highly recommend you use the SAM templates in the GitHub repository to create the resources, opitonally you can manually create them. Want to enable SAML federated authentication? You can use the AWS platform to exchange SAML assertions for short-term, temporary AWS credentials. When you build enterprise web applications, it is imperative to ensure that authentication and authorization (AuthN and AuthZ) is done consistently and follows industry best practices. At AWS, we have built a service called Amazon Cognito that allows you to create unique Identities for users and grants them short-term credentials for interacting with AWS services. These credentials are tied to roles based on IAM policies so that you can grant or deny access to different resources. Want to create your own user directory that can scale to hundreds of millions of users? 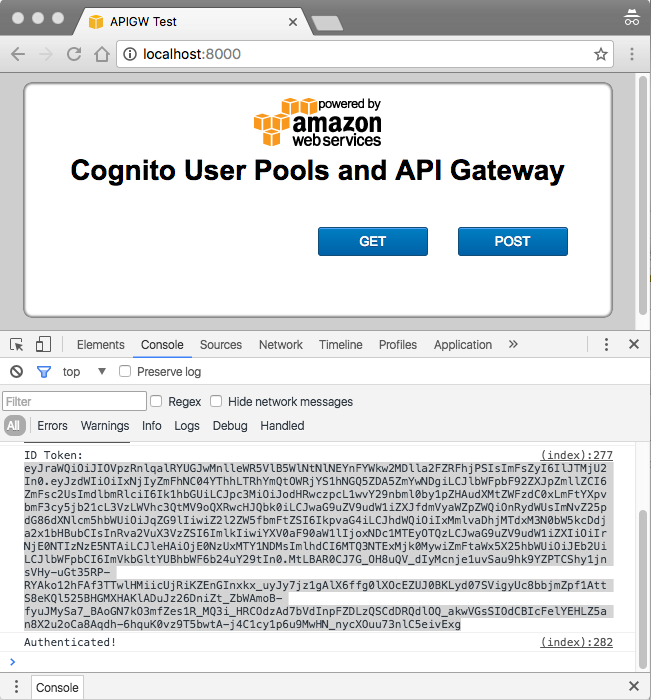 Amazon Cognito user pools are fully managed so that you don’t have to worry about the heavy lifting associated with building, securing, and scaling authentication to your apps. 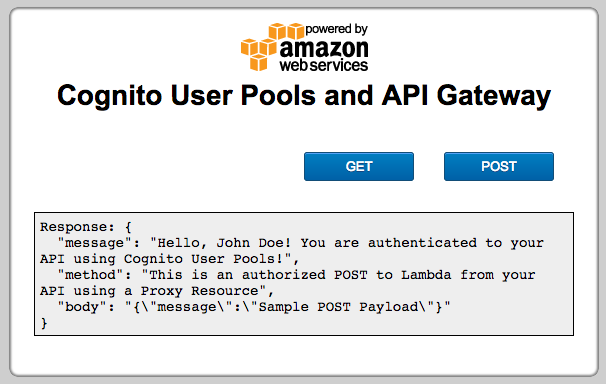 The AWS Mobile blog post Integrating Amazon Cognito User Pools with API Gateway back in May explained how to integrate user pools with Amazon API Gateway using an AWS Lambda custom authorizer. 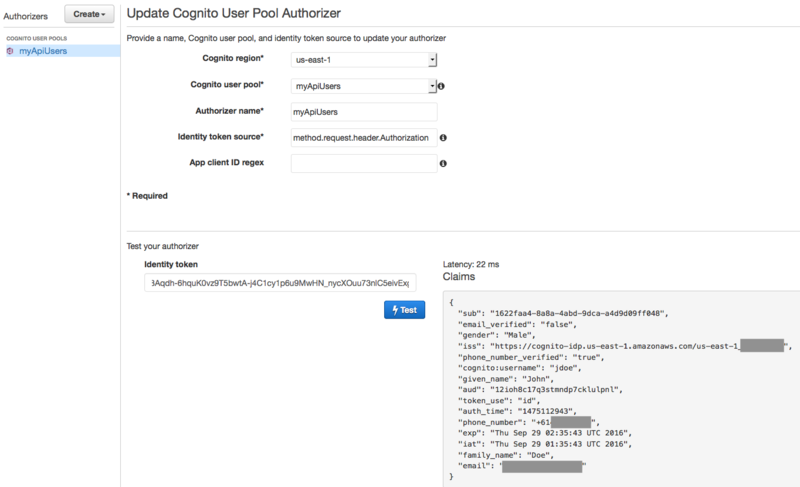 Since then, we’ve released a new feature where you can directly configure a Cognito user pool authorizer to authenticate your API calls; more recently, we released a new proxy resource feature. 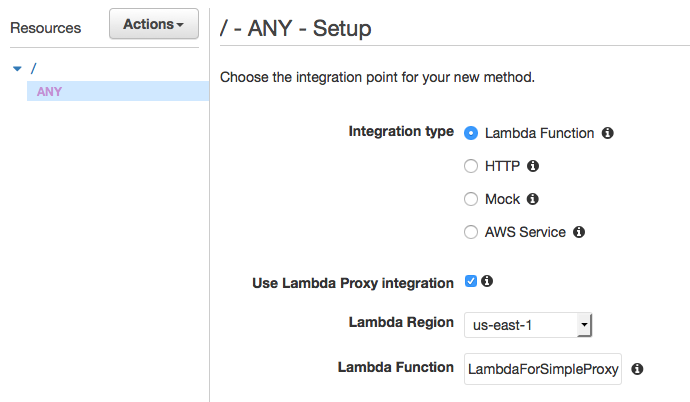 In this post, I show how to use these new great features together to secure access to an API backed by a Lambda proxy resource. Be mindful that if you are using a similar solution for production workloads you will need to request a SMS spending threshold limit increase from Amazon SNS in order to send SMS messages to users for phone number verification or for MFA. For the purposes of this article, since we are only testing our API authentication with a single user the default limit will suffice. Your Cognito user is now ready and available to connect. 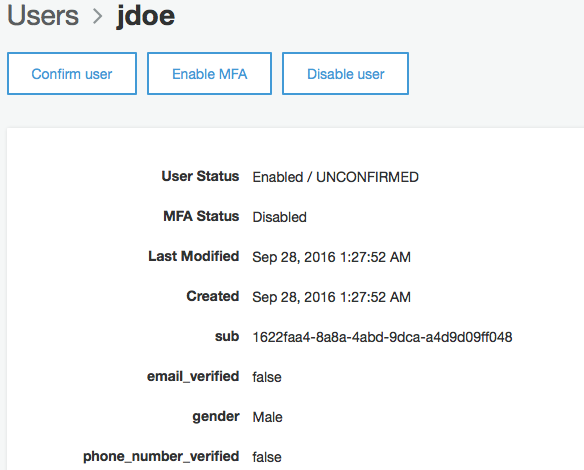 You can now use a little front end web page to authenticate users and test authorized calls to your API. In order for it to work, you need to add some external libraries and dependencies including the API Gateway SDK you just generated. You can find more details in our Cognito as well as API Gateway SDK documentation guides. After adding some extra CSS styling of your choice (for example adding "list-style: none" to remove list bullet points), the front end is ready. You can test it by using a local web server in your computer or a static website on Amazon S3. In your front end, you can now perform authenticated GET calls to your API by choosing GET. Or you can perform authenticated POST calls to your API by choosing POST. It’s possible to improve this solution by integrating an Amazon DynamoDB table, for instance. You could detect the method request on event.httpMethod in the Lambda function and issue a GetItem call to a table for a GET request or a PutItem call to a table for a POST request. There are lots of possibilities for this kind of proxy resource integration. The Cognito user pools integration with API Gateway provides a new way to secure your API workloads, and the new proxy resource for Lambda allows you to perform any business logic or transformations to your API calls from Lambda itself instead of using body mapping templates. These new features provide very powerful options to secure and handle your API logic. I hope this post helps with your API workloads. If you have questions or suggestions, please comment below. 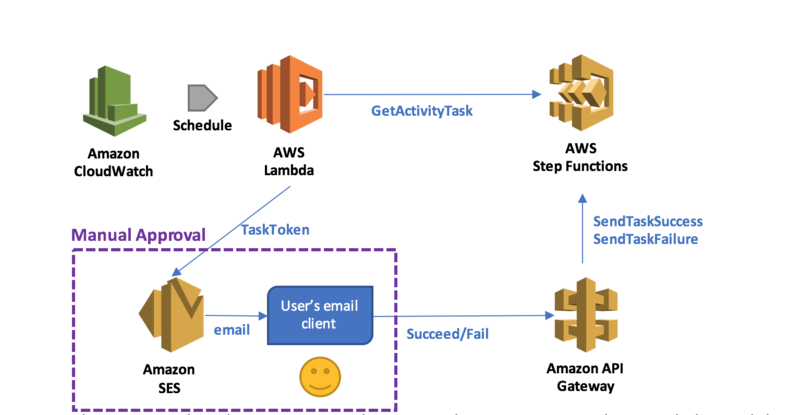 A typical serverless application consists of one or more functions triggered by events such as object uploads to Amazon S3, Amazon SNS notifications, or API actions. Those functions can stand alone or leverage other resources such as Amazon DynamoDB tables or S3 buckets. The most basic serverless application is simply a function. 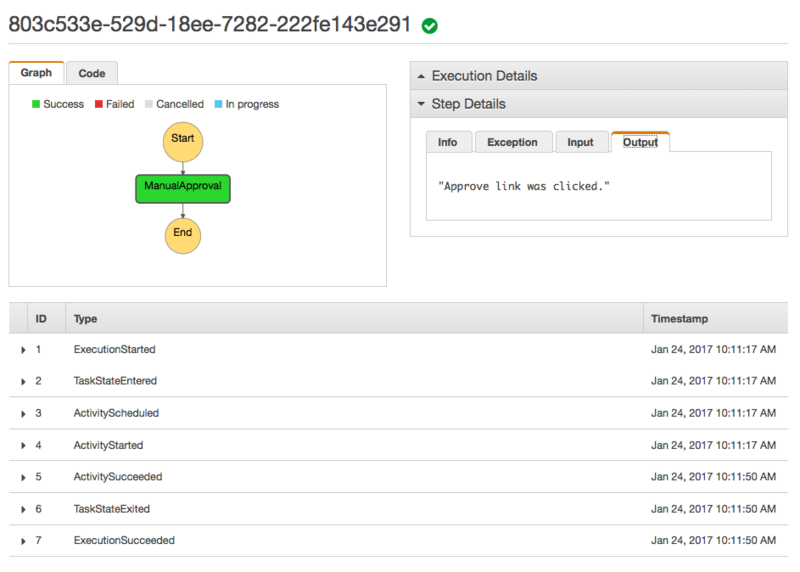 This post shows you how to leverage AWS services to create a continuous deployment pipeline for your serverless applications. You use the Serverless Application Model (SAM) to define the application and its resources, CodeCommit as your source repository, CodeBuild to package your source code and SAM templates, AWS CloudFormation to deploy your application, and CodePipeline to bring it all together and orchestrate your application deployment. Pipelines pick up source code changes from a repository, build and package the application, and then push the new update through a series of stages, running integration tests to ensure that all features are intact and backward-compatible on each stage. Each stage uses its own resources; for example, if you have a "dev" stage that points to a "dev" function, they are completely separate from the "prod" stage that points to a "prod" function. If your application uses other AWS services, such as S3 or DynamoDB, you should also have different resources for each stage. 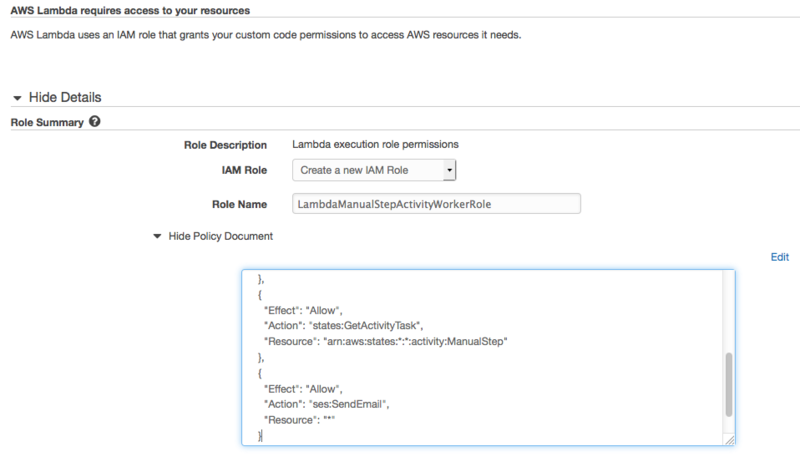 You can use environment variables in your AWS Lambda function to parameterize the resource names in the Lambda code. The source repository contains an application SAM file and a test SAM file. The SAM file called app-sam.yaml defines all of the resources and functions used by the application. In the sample, this is a single function that uses the Express framework and the aws-serverless-express library. The application SAM template exports the API endpoint generated in a CloudFormation output variable called ApiUrl. The SAM file called test-sam.yaml defines a single function in charge of running the integration tests on each stage of the deployment. The test SAM file exports the name of the Lambda function that it creates to a CloudFormation output variable called TestFunction. You can find the link to start the pipeline deployment at the end of this section. 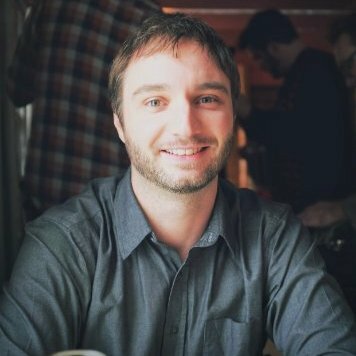 The template asks for a name for the service being deployed (the sample is called TimeService) and creates a CodeCommit repository to hold the application's source code, a CodeBuild project to package the SAM templates and prepare them for deployment, an S3 bucket to store build artifacts along the way, and a multi-stage CodePipeline pipeline for deployments. The pipeline picks up your code when it's committed to the source repository, runs the build process, and then proceeds to start the deployment to each stage. Before moving on to the next stage, the pipeline also executes integration tests: if the tests fail, the pipeline stops. Source – the source step picks up new commits from the CodeCommit repository. CodePipeline also supports S3 and GitHub as sources for this step. 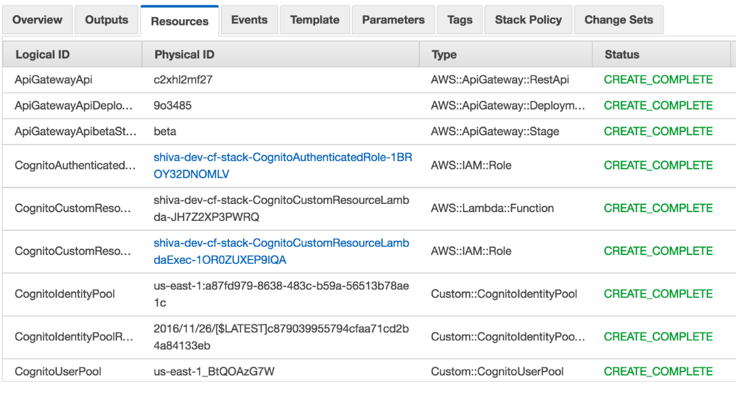 Build – Using CodeBuild, you pull down your application's dependencies and use the AWS CLI to package your app and test SAM templates for deployment. The buildspec.yml file in the root of the sample application defines the commands that CodeBuild executes at each step. DeployTests – In the first step, you deploy the updated integration tests using the test-sam.yaml file from your application. You deploy the updated tests first so that they are ready to run on all the following stages of the pipeline. Beta – This is the first step for your app's deployment. 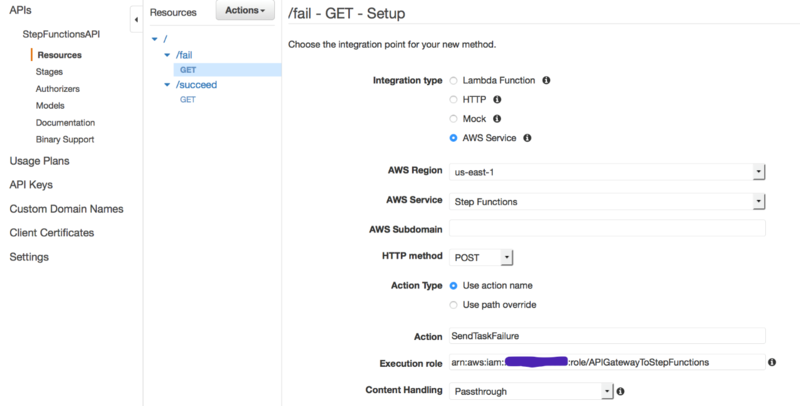 Using the SAM template packaged in the Build step, you deploy the Lambda function and API Gateway endpoint to the beta stage. At the end of the deployment, this stage run your test function against the beta API. Gamma – Push the updated function and API to the gamma stage, then run the integration tests again. Prod – Rinse, repeat. Before proceeding with the prod deployment, your sample pipeline has a manual approval step. Choose Launch Stack below to create the pipeline in your AWS account. This button takes you to the Create stack page of the CloudFormation console with the S3 link to the pre-populated template. Choose Next and customize your StackName and ServiceName. Skip the Options screen, choose Next, acknowledge the fact that the template can create IAM roles in your account, and choose Create. Integration tests decide whether your pipeline can move on and deploy the app code to the next stage. To keep the pipeline completely serverless, we decided to use a Lambda function to run the integration tests. To run the test function, the pipeline template also includes a Lambda function called <YourServiceName>_start_tests. The start_tests function reads the output of the test deployment CloudFormation stack as well as the current stage's stack, extracts the output values from the stacks (the API endpoint and the test function name), and triggers an asynchronous execution of the test function. The test function is then in charge of updating the CodePipeline job status with the outcome of the tests. The test function in the sample application generates a random success or failure output. In the future, for more complex integration tests, you could use AWS Step Functions to execute multiple tests at the same time. The source code includes the application itself under the app folder, and the integration tests for the application under the test folder. In the root directory for the sample, you will find two SAM templates, one for the application and one for the test function. The buildspec.yml file contains the instructions for the CodeBuild container. At the moment, the buildspecs use npm to download the app's dependencies and then the CloudFormation package command of the AWS CLI to prepare the SAM deployment package. For a sophisticated application, you would run your unit tests in the build step. After you have downloaded the sample code, you can push it to the CodeCommit repository created by the pipeline template. The app-sam.yaml and test-sam.yaml files should be in the root of the repository. Using the CodePipeline console, you can follow the progress of the application deployment. The first time the source code is imported, the deployment can take a few minutes to start. Keep in mind that for the purpose of this demo, the integration tests function generates random failures. 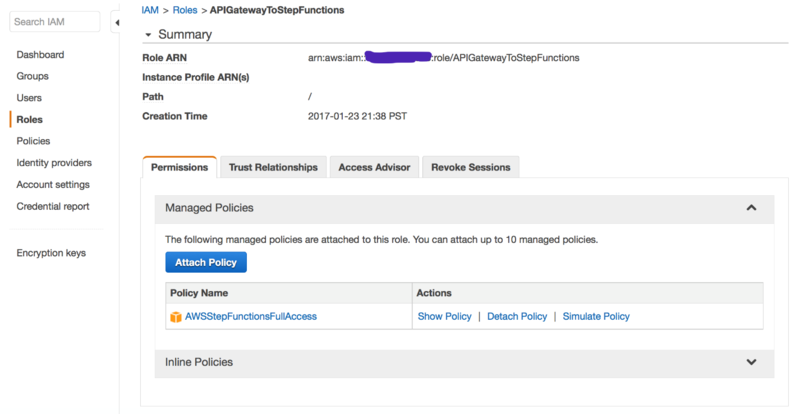 After the application is deployed to a stage, you can find the API endpoint URL in the CloudFormation console by selecting the correct stack in the list and opening the Outputs tab in the bottom frame. 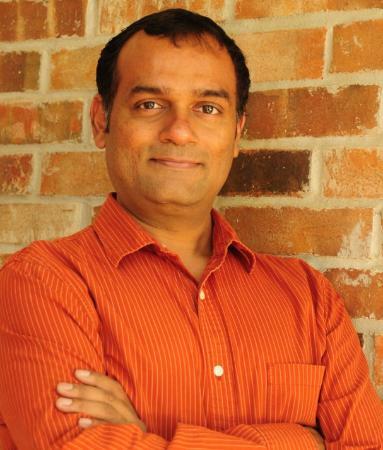 Continuous deployment and integration are a must for modern application development. It allows teams to iterate on their app at a faster clip and deliver new features and fixes in customers' hands quickly. With this pipeline template, you can bring this automation to your serverless applications without writing any additional code or managing any infrastructure. You can re-use the same pipeline template for multiple services. The only requirement is that they conform to the same structure as the sample app with the app-sam.yaml and test-sam.yaml in the same repository. Amazon API Gateway helps you quickly build highly scalable, secure, and robust APIs. Today, we are announcing an integration of API Gateway with AWS Marketplace. You can now easily monetize your APIs built with API Gateway, market them directly to AWS customers, and reuse AWS bill calculation and collection mechanisms. AWS Marketplace lists over 3,500 software listings across 35 product categories with over 100K active customers. With the recent announcement of SaaS Subscriptions, API sellers can, for the first time, take advantage of the full suite of Marketplace features, including customer acquisition, unified billing, and reporting. For AWS customers, this means that they can now subscribe to API products through AWS Marketplace and pay on an existing AWS bill. This gives you direct access to the AWS customer base. 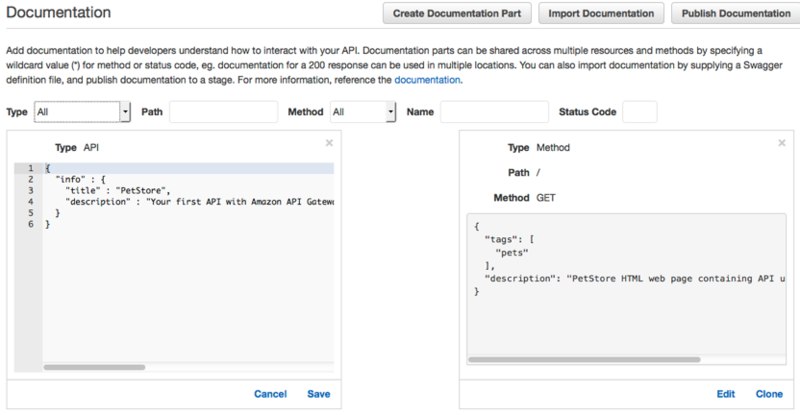 To get started, identify the API on API Gateway that you want to sell on AWS Marketplace. Next, package that API into usage plans. 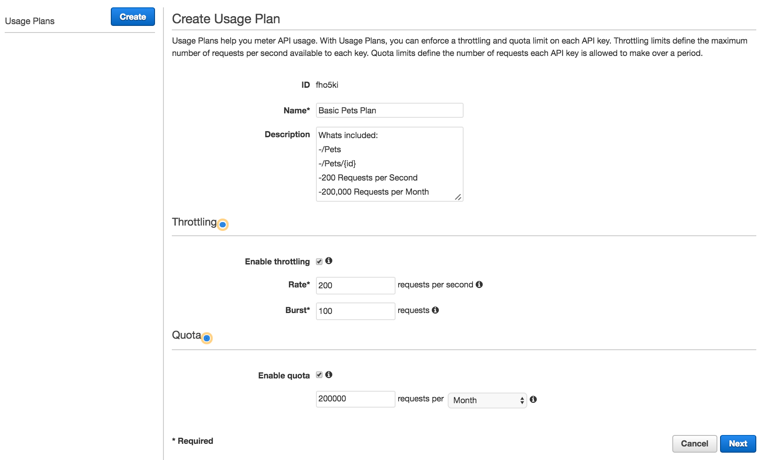 Usage plans allow you to set throttling limits and quotas to your APIs and allow you to control third-party usage of your API. You can create multiple usage plans with different limits (e.g., Silver, Gold, Platinum) and offer them as different API products on AWS Marketplace. 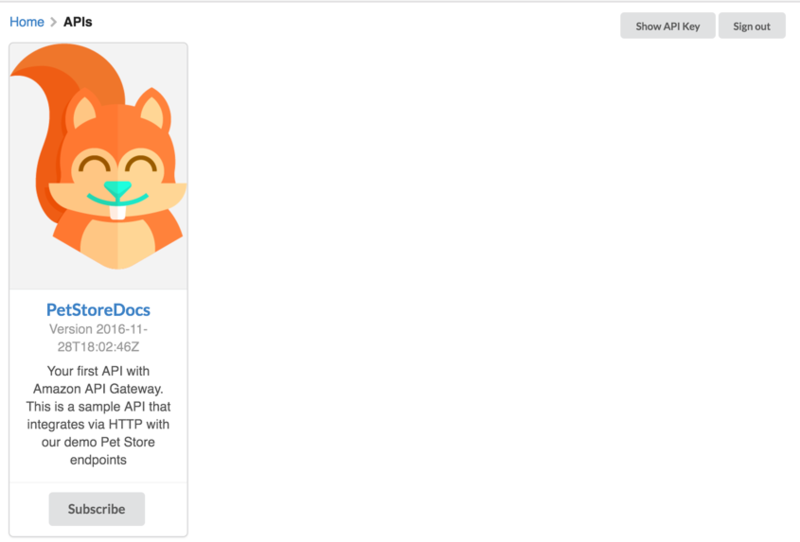 Let’s suppose that you offer a Pet Store API managed by API Gateway and you want to start selling it through AWS Marketplace: you must offer a developer portal, a website that you must maintain that allows new customers to register an account using AWS-provided billing identifiers. Also, the portal needs to provide registered customers with access to your APIs during and after purchase. To help you get started, we have created a reference implementation of a developer portal application. 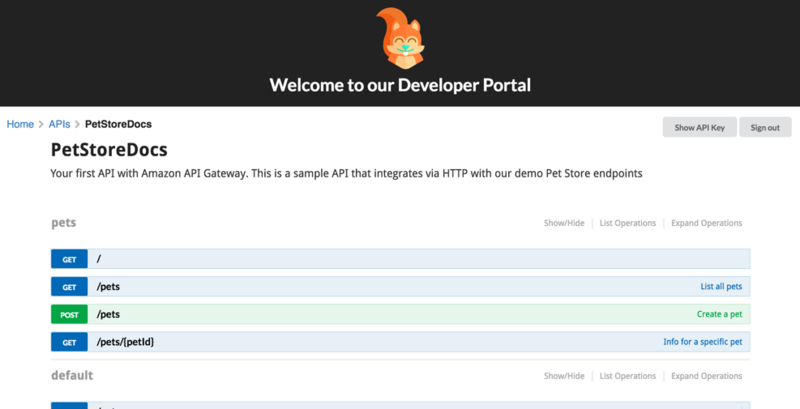 You can use this implementation to create a developer portal from scratch, or use it as a reference guide to integrate API Gateway into an existing developer portal that you already operate. 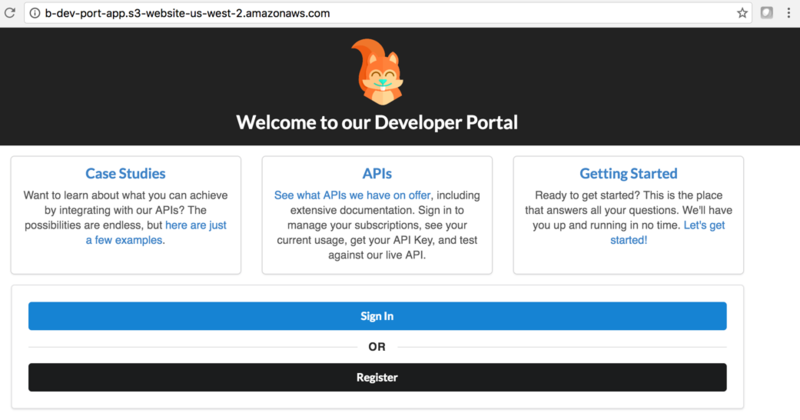 For a detailed walkthrough on setting up a developer portal using our reference application, see (Generate Your Own API Gateway Developer Portal). After you have set up your developer portal, register as a seller with the AWS Marketplace. After registration, submit a product load form to list your product for sale. In this step, you describe your API product, define pricing, and submit AWS account IDs to be used to test the subscription. You also submit the URL of your developer portal. Currently, API Gateway only supports “per request” pricing models. After you have registered as a seller, you are given an AWS Marketplace product code. Log in to the API Gateway console to associate this product code with the corresponding usage plan on API Gateway. This tells API Gateway to send telemetry records to AWS Marketplace when your API is used. After the product code is associated, test the “end user” flow by subscribing to your API products using the AWS IDs that you submitted via the Marketplace; verify the proper functionality. When you’ve finished verifying, submit your product for final approval using instructions provided in the Seller Guide. Visit here to learn more about this feature.